IIBM Patna is recognised to run PGDM equivalent to MBA in Regular mode by AICTE, Ministry of HRD, Govt. of India. PGDM program imparted by IIBM Patna is equivalent to MBA Degree. Application form is available for GDPI. Institute of Business Management, IIBM Patna requires an in-person meeting prior to the candidate’s submission of application materials. The interview is a conversation about the applicant's background, experience, and interests, and also an opportunity for the applicant to ask questions about the program and admissions process. Candidates should submit all of the following application materials, in one package, directly to Institute of Business Management, IIBM Patna for review. Though MAT scorecard is mandatory, all communications about your application should occur directly with IIBM Patna. Please submit, by mail or in person, the six parts of the application together in one package. 2. Non-refundable Rs.300 application fee. Please make your demand draft or check payable to Indian Institute of Business Management payable at Patna, mail it to IIBM Patna with your application package. 3. Resume along with Birth Certificate/Standard X Certificate. Please submit a resume or CV of no more than two pages. 4. Two copies of official sealed certificate from every undergraduate post-secondary institution previously attended. If you've completed graduate level course work, submit one copy of your graduate transcripts. All certificates should be official and received in sealed envelopes. 5. Relevant experience certificate. Any combination of professional or academic that provide a well-rounded perspective of you. Please have at least one of them be a recent professional or workplace reference, ideally a supervisor. 6. MAT/C-MAT/XAT/CAT Scorecard. Please submit the official scorecard to IIBM Patna. Previous year scorecard is also considered. Courier and in-person drop offs can use this address as well for application delivery. We care about our applicants' academic and professional credentials — as well as their personal commitment to creating change. IIBM puts a premium on attracting a diverse student body, with a wide range of ideas and backgrounds. We welcome applicants with differences of race, gender, socio-economic background, religion, sexual orientation and those who are differently-abled. We also encourage applications from every sector — public, private and nonprofit. 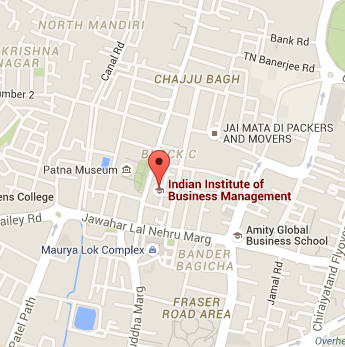 The IIBM PGDM admissions process is highly selective. Students must have completed a bachelor’s degree (no specific major required) from an accredited institution. High intellectual capacity and leadership capability are expected and should be demonstrated in the application materials. IIBM highly values professional experience. Most of our PGDM students have at least 2 years of work experience before joining the program. Aspiration to bring greater ethics and sustainability values into business leadership. It will take support, skill and passion to live in the tension between the current reality of business and the vision for a more better future. We believe it will take patience, wisdom and a sense of humor to complete a program that is both idealistic and practical at the same time. Institute of Business Management, IIBM Patna is non-discriminatory in its admissions, accepting qualified applicants regardless of age, gender, religion, marital status, disabilities, sexual orientation, or national or ethnic origin.